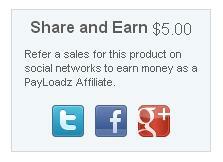 Refer a sale or sales to my product(s) on social networks and on your website to earn money as an Affiliate. It's easy and free to become my affiliate, and you will receive payment for any affiliate sales you make once a month. There is a 5.00 minimum payout by PayPal! Just find the product you want to promote here at my store, and if that product has an affiliate promo, it will state it at the bottom of the description and cart button, with a link provided to the page it exists on at PayLoadz. Click to go there and look for the affiliate info at the bottom right of the PayLoadz page, it looks something like this. Click either the Twitter, Facebook, or Gmail icon to add your email address, get your code, and Promote Promote Promote!! Join our Network to interact with me and other members, and get freebies only available to members.